Established in 1967, Hyundai Motor Co. has grown into the Hyundai Motor Group, with more than two dozen auto-related subsidiaries and affiliates. Hyundai Motor – which has seven manufacturing bases outside of South Korea including Brazil, China, the Czech Republic, India, Russia, Turkey and the U.S. – sold 4.4 million vehicles globally in 2012. Hyundai Motor, which employs over 80,000 workers worldwide, offers a full line-up of products including small to large passenger vehicles, SUVs and commercial vehicles. Our environmental research facility in Mabuk, South Korea, is constantly developing and refining our range of low-carbon and zero-emission vehicles. Hyundai is helping to spearhead the movement that promotes hydrogen as a future fuel for Europe. With our fuel cell technology now becoming viable to everyday users, being part of UK H2Mobility is vital to our plans for the implementation of low-carbon and zero-emission vehicles in both the UK and Europe. 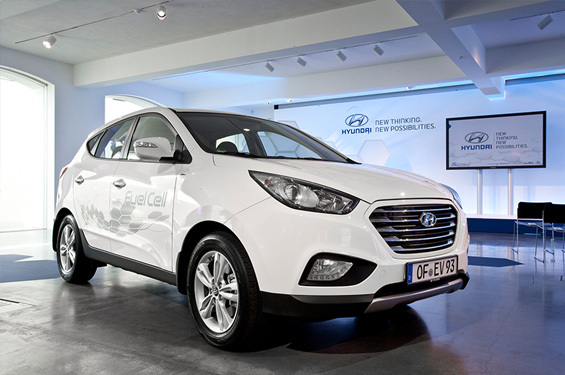 With the Hyundai ix35 Fuel Cell, the first Fuel Cell Electric Vehicle (FCEV) to enter series production, Hyundai is in a position to both advise and consult with other members of UK H2Mobility to ensure a smooth roll out of the initial market for FCEVs and also develop the FCEV sector into the mass market for the UK.